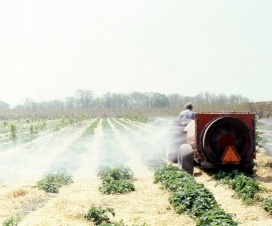 In 2013, A few strawberry growers were asked what spray volume they used to apply routine pesticides. The results ranged from 250 to 650 l/ha (26.7 to 69.5 US g/ac) for fungicides, herbicides and insecticides. Miticide applications were as high as 750 l/ha (80.2 US g/ac). This variation is hardly surprising given that the volume used is a decision made by each applicator to balance the number of refills they have to suffer while still getting good coverage. It can be affected by row spacing, crop staging, the nature of the pest, the pesticide mode of action and the application method. If the target is white grubs in the root zone (e.g. Admire) or phytopthora root rot (e.g. Ridomil) then the spray should be focussed at the base of the plant in a banded application. Performing a broadcast application that covers the alleys as well as the plant rows is potentially wasted product. Soil that is compressed or has high clay content won’t soak up water as quickly as drier, looser or sandier soil. If the beds are raised and resist absorption, much of the volume will run off into the alleys. This may not be desirable if the target is the raised bed itself. The following basic water movement principles come from the Manitoba Agriculture, Food and Rural Initiatives Soil Management Guide. Water flows more quickly through large pores (sandy soils) than small pores (clay soils); water is held more tightly in small pores (clay soils) than in large pores (sandy soils). Water moves from wet areas to dry areas (not necessarily by gravity) due to forces of adhesion and cohesion. This is called matric flow. Water will not move from small soil pores to large soil pores unless conditions are saturated. Spraying on a hot, dry day means a higher rate of evaporation. As the carrier water evaporates, the product will have less opportunity to infiltrate the soil. Conversely, applying product just before a heavy rain can result in a much diluted product being rinsed too deeply into the soil and beyond the target area. Consider that one millimetre of rain on one hectare of land is 10,000 litres. That seems like a lot, but how deeply does it infiltrate into soil? 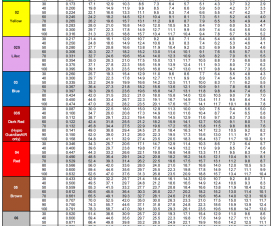 One way to know is to use calculations based on soil porosity and bulk density. From these calculations it can be generalized that 25 mm of rain will infiltrate 45 mm into dry, sandy soil, but only 32 mm into dry clay soil. Remember, that 25 mm of rain represents 250,000 l/ha! 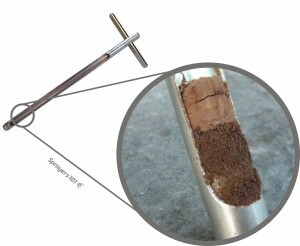 The soil probe. See how far water infiltrates soil by taking core samples. Perhaps the best way to know how far water will infiltrate the soil is to use a soil probe (aka soil sample tube). They can be purchased from local dealers for around $100.00, or they could be borrowed from whomever provides soil sampling services in the area. For the best results, perform this test in multiple locations in the field. Here are three methods for applying a drench to matted-row strawberries. 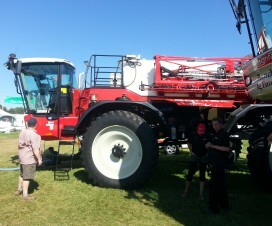 Some growers elect to use their existing sprayer setup, but slow down to get more volume on per hectare. For example, if the grower normally applies 500 l/ha (53.4 US g/ac) driving at 5 kph (3.1 mph) they would have to drive 1.25 kph (0.78 mph) to achieve the 2,000 l/ha some labels require. If the sprayer tank held 1,500 litres (~ 400 US gallons) that would mean doing 0.75 hectares (1.9 acres) to a tank compared to the normal 3 hectares (7.5 acres). That would be four times as long, without considering the time for the extra refills. 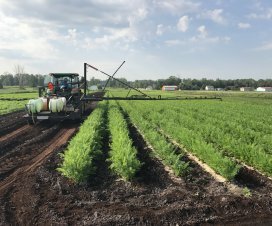 When slowing down is not a viable option, some growers elect to re-nozzle. It may be tempting to increase the operating pressure (if that’s possible) to increase output on existing nozzles, but that makes fine droplets which tend to drift off target, and many labels indicate a need for coarse droplets in a drench. The largest hollow-cone nozzles will only emit ~870 l/ha at 5.0 kph (93 US g/ac at 3.1 mph) and that’s at 125 psi, which many trailed sprayers cannot manage. However, there are other nozzles. TeeJet sells the Streamjet fertilizer nozzle (figure 2) which uses lower pressures up to 60 psi to emit as much as 2,310 l/ha at 5.0 kph (247 US g/ac at 3.1 mph). The grower can maintain their travel speed, but will still have to refill more often. Still another choice is to apply the product using the existing sprayer set-up, using current volume, just prior to a rain event or sprinkler (not drip line) irrigation. For example, if the grower normally applies 500 L/ha (53.4 US g/ac), they would continue to do so. If the grower is relying on rain to wash the product in, it should be sufficient precipitation to move the product to the desired soil depth. Where sprinklers are an option, this can be controlled, and the depth of infiltration tested with a soil probe. Washing in the spray should take place as soon after application as possible to ensure the product is distributed evenly into the soil. No matter the method used, always ensure there is enough volume to infiltrate the soil to the desired depth. That is how these products were formulated to be as efficacious as possible.